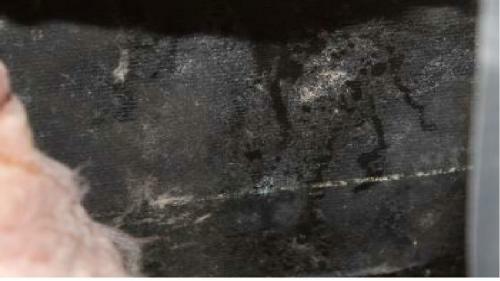 What the home cottage or commercial building owner or buyer needs to know about mould. Home Inspectors view of diy repairs. Do it yourself spray foam is ideal for rim joist and other areas it is difficult to seal and vapour barrier around. 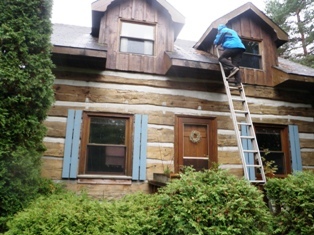 How qualified is your local national franchise home inspector? 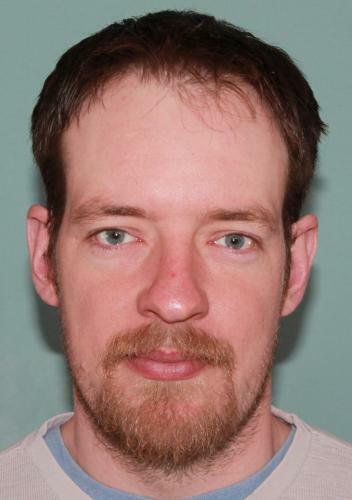 Property buyer alert! The WETT inspection could be a disaster in the making for you. What Bracebridge, Gravenhurst, and Muskoka home buyers need to know about Egress windows and window wells. 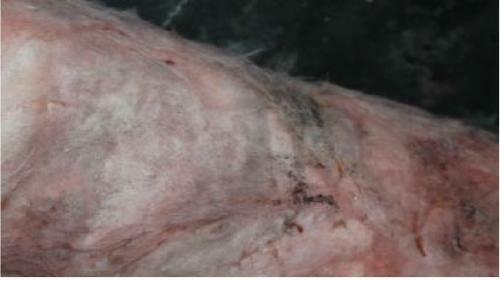 Mould in the home, to test or not to test? Do it yourself spray foam: ideal for rim joist and other areas it is difficult to seal vapour barrier around. Do It Yourself Spray Foam for Rim Joists and Crawlspaces. Do it yourself spray foam: ideal for rim joist and other areas it is difficult to seal vapour barrier around. 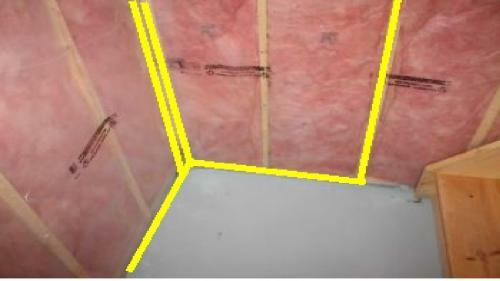 Where the yellow is in the photos below we should be seeing a line of black or grey acoustical sealant. Acoustical sealant stays flexible and never hardens keeping the seal between the vapour barrier and the home framing or foundation walls. Sealing the flat areas is fairly easy to do properly, even though here it was not done at all. Stapling the vapour barrier up and expecting it to seal warm moist air from the cold perimeter walls is like expecting a button up jacket to be waterproof. It is not hard technically to fix this issue but it is work. a close-line. The basement will need a dehumidifier plugged in and run for some time to dry out the walls along with fans to circulate the air. Walls may not dry entirely until the heating season is over as warm heated air will condense on perimeter cold walls, but, at least by taking down the vapour barrier and pulling out the insulation batts you remove the probability of mould growth in the wall/insulation cavities. 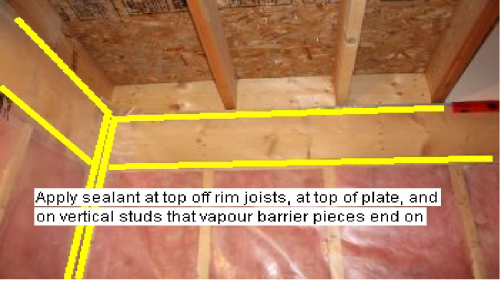 It is much harder to deal with rim joist insulation and sealing the vapour barrier properly. What is much harder to deal with is insulating the rim joists properly and then sealing it with the vapour barrier, acoustical sealant and tuc tape. When you have a vapour barrier installation that looks like this you have exactly the same possibility of mould growth conditions as well as the added possibility of wood rot in the joist ends and the sill plates. This can then be very serious and become a major structural issue. 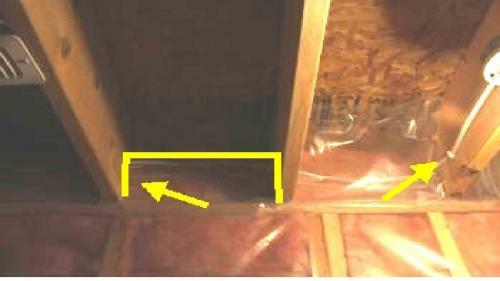 If this is in a crawl space such as many we find in our inspections of home cottage and commercial properties in Orillia, Gravenhurst, Bracebridge and Muskoka you will not likely find out till the floor drops from collapsing floor joists. There is no seal on vapour barrier at all. All joints should be taped with tuk tape ( the red type ) and all contact areas such as along sill at base of wall anywhere vapour barrier ends on studs and along upper top plate should be sealed with acoustical caulk, taped and stapled to seal. all rim joist spaces to be foamed. 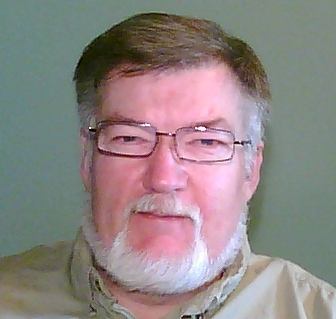 Retro fit, repairs, and/or replacement work are not required to follow new building codes. Do it yourself spray foam is an ideal alternative for rim joist and other areas it is difficult to seal vapour barrier around. It is relatively inexpensive and can be done following manufacturers directions fairly quickly. It easily moulds itself to rough uneven surfaces to seal properly and best of all it is very efficient as it is both insulation and vapour barrier in one. Here we see the spraying process using the supplied DIY products and the next photo is of a completed spray foam rim joist project. There are several suppliers of DIY spray foam kits and they come in at least two sizes. One for smaller projects like rim joists on small to medium size homes and a size that would suit a more ambitious project like a crawl space or perhaps a cold room, walk in cooler, wine cellar, etc. I advise clients during our home, cottage, and commercial inspections in Orillia, Gravenhurst, Bracebridge, and Muskoka that the process is fairly simple and following manufacturers directions will give the best results and that rim joist sealing is an ideal first DIY spray foam project. 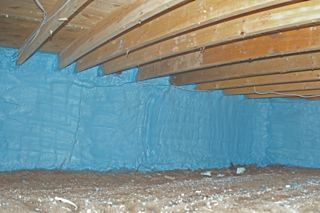 Spray foam in basement rim joists works really well and this is why it has become code for new construction. 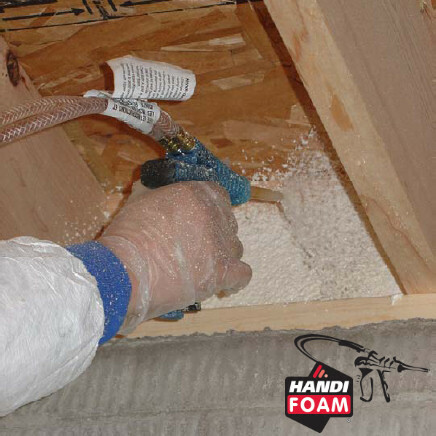 Spray foam in crawl spaces works even better and for rim joist in crawls it makes this often nasty job of insulating and sealing rim joists a much more pleasant and shorter experience. 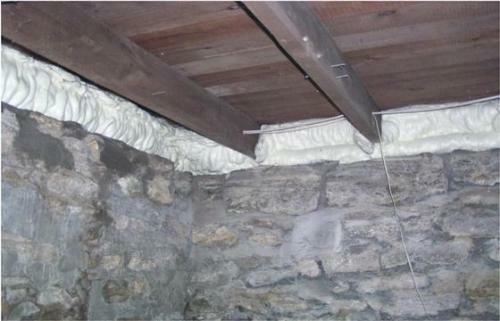 Here we see the rim joist spray foamed above an older stone foundation. These types of rough stone foundations are almost impossible to insulate and vapour barrier properly and thus many of them are not done. DIY spray foam kits makes short work of this job. While the entire crawl pictured was likely professionally done, it is entirely possible to do it yourself. Calculations for the square footage, insulating values, and yield for the different size kits are on the various manufacturers websites. 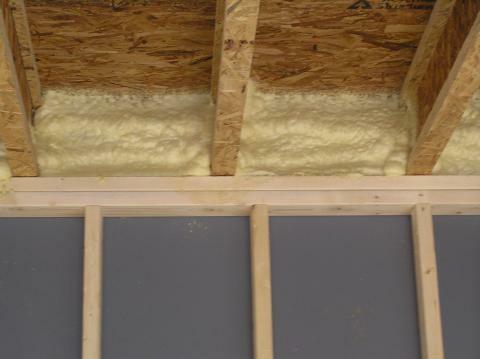 Tiger Foam Canada's spray foam is not only an insulation and a vapour barrier it is also fire rated. http://www.tigerfoam.ca/ and that may be a consideration in your purchase decision. There are several other Canadian suppliers of spray foam kits so check out the web for further information on these products. DIY spray foam kits are the ideal answer to some difficult insulation and vapour barrier problems.